Thanks, Lstream!! You use a similar method as I did at AFB1 -- before, as you said, it no longer worked. Here, I am trying to figure out how to make my image a bit narrower (the size of Mark's), so it doesn't widen all of the posts on that page. Isn't that just a question of picking the right image resolution to link to? I just happened to link to the largest one, but there are smaller alternatives. Lstream, you say that like it would be easy for ME to figure out! This is just a test to see how the chart presents. This is perfect!! What are the dimensions?? You are a sandbagger . You got an entire new forum up and running in about a day. Outstanding work. Pretty soon we will be viewing your perfectly presented charts too. Try keeping the images under 1024 pixels wide. Testing the app from iPhone. 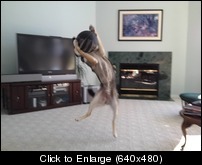 Picture of maniac dog from camera roll. The image you like size wise is 700w x 639h. I agree it does seem to present well. Even when you quoted it, it still fits nicely on the ipad. I personally don't care for the "click to enlarge" images so I use photobucket. I also have a flicker account but I just like photobucket better because it just seems easier. All you have to do then is paste it wherever you like. You can do a lot of different types of editing, most importantly, image size with Photobucket. Thanks, Mark!!! I'll check it out!!! NOW, when you click on the "Insert Image" icon, you're prompted for the URL. AND, the "Insert Hyperlink" icon now works like the <a> prompt did on the old AFB1 site. YAY!!!!! Getting the functionality like we want it!!!!!!! Actually Love you have managed to do in a couple of days what has been asked for at the AFB for a long time. This site is already better than any other forum I have ever been apart of. Congrats. Thought I'd try an upload. A screech owl in our backyard. LOL. I could take that comment wrong. Thanks I needed a laugh. I tried rotating the photo on my iPhone then uploading, but in previewing the post it was still landscaped. It is practice Rick, no worries. Before uploading you need to rotate, then save the pic, then upload. Thank you, I will practice.